How Do I Use the New Property CrossCheck? Place your cursor in a comparable grid field and press CTRL+K on your keyboard to launch the CrossCheck window. Use the dropdown to select subject or comparable property. To search for a property record, use the % symbol as a wild card in place of the exact address (ex. 123 Main%, leaving a field blank will automatically include all records). Use the scroll bars or arrow buttons to navigate the grid and view more database entries. The total number of matching property records will be indicated by the counter in the lower left corner. 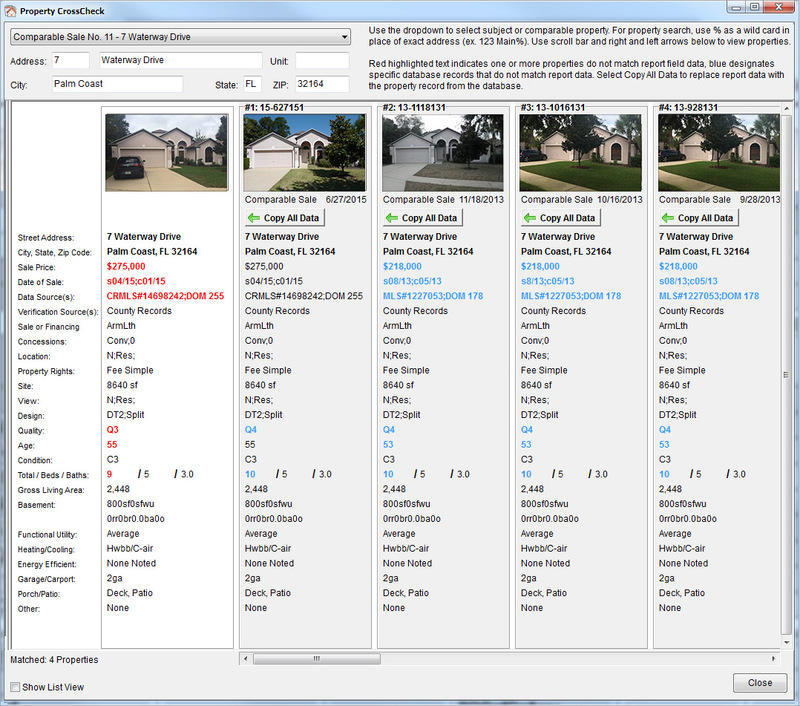 Select Show List View to view the table listing of properties that match your search criteria. Red highlighted text indicates one or more properties do not match report field data, blue designates specific data points that do not match your report data. Select Copy All Data to replace report data with the property record from the database. A confirmation dialogue will then ask if you’d like to replace the existing report data with the database record. Select OK and the word Updated will appear at the top of the report data column. The dropdown list will also have the word Updated next to the property listing to indicate that you’ve already crosschecked that address. When complete, close the window and the newly added property records will be in the appropriate slots in your report. As always, we’re here to help you, so please email onecall@aciweb.com or call 800-234-8727 if you have any questions. Does the new Comp CrossCheck support partial address lookups? Does Comp CrossCheck work for both Subject and Comps? How do I change the column view of the Comp CrossCheck results? How do I use Comp CrossCheck to look up properties by address? How do I run Comp CrossCheck? How do I import data from CrossCheck into my report?